Scholars often recognize the elements of a painting that are important to its underlying meaning even when they themselves continue to look at art like a photograph. That perception, the idea that painting mimics sight, has a long tradition. Patrons, art theorists and ordinary spectators have looked at art that way for over 500 years; it is the view conventionally expressed in art scholarship; it was not the artist’s. 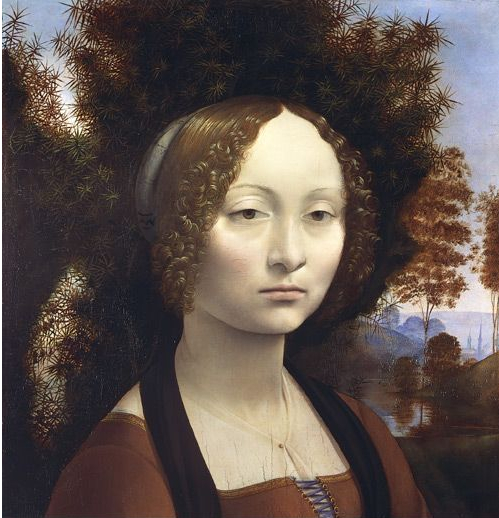 Leonardo da Vinci, Portrait of Ginevra de’ Benci (c.1474) Oil on panel. National Gallery of Art, Washington, DC. 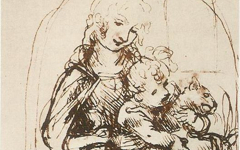 Today Ginevra’s poetry is lost but in Leonardo's day her fame as a poet was widespread. Yet Garrard errs in thinking that the portrait represents the poet herself because Leonardo was not an illustrator. He would not have just copied Ginevra's face. The portrait represents instead the feminine side of Leonardo’s own poetic mind in the process of creation and the laurels and palm, even if she deserved them in life, are Leonardo’s here. Scholars assume that the portrait is a likeness even though Renaissance patrons often complained about the difficulty of getting a good likeness from a great master. Research on this site further demonstrates that many great portraits are a fusion of faces. 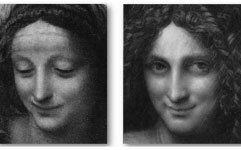 One need only compare Ginevra’s to the Mona Lisa‘s (left) to recognize disturbing similarities between them. Consider, for instance, the overall proportions, the foreheads, noses and chins. 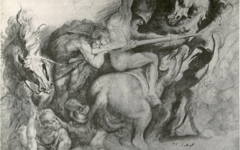 Furthermore, just as Michelangelo’s Last Judgment represents the act of creation in a poet’s mind and just as the protagonist in Giorgione’s Tempesta has been identified as a poet too, so the act of creation in Leonardo's poetic mind is the subject here.3 Giorgione’s and Michelangelo’s scenes are clearly not photographic in nature; nor, despite appearances, is Leonardo’s.